House Republican lawmakers are asking Speaker Nancy Pelosi to hold hearings on the Green New Deal. “As the committees to which it has been referred, we have a responsibility to fully understand how the Green New Deal will affect the cost of living and economic mobility of hardworking,” 11 House GOP members wrote to Pelosi on Thursday. “Americans. We need to get to the facts, the American people deserve answers,” wrote lawmakers, including Reps. Jim Jordan of Ohio, Rob Bishop of Utah, Kevin Brady of Texas and Greg Walden of Oregon. Republicans also plan to hold a press conference Thursday to push their case, Axios reported. House Minority Leader Kevin McCarthy is set to attend the press conference, signaling a coordinated effort to keep the Green New Deal at the forefront ahead of the 2020 elections. 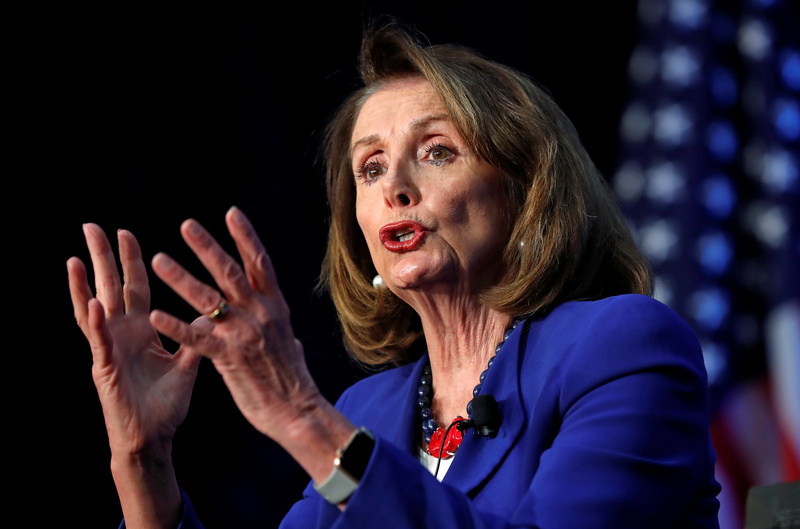 Speaker of the House Nancy Pelosi addresses guests at an event hosted by the Economic Club of Washington in Washington, U.S., March 8, 2019. REUTERS/Kevin Lamarque. Moderate Democrats have distanced themselves from the resolution or, like West Virginia Sen. Joe Manchin, joined with Republicans to reject it altogether. The Green New Deal calls for aggressive goals of achieving “net-zero” greenhouse gas emissions within 10 years, which implies more aggressive policies than cap-and-trade. Republicans worry such policies will raise energy prices and dramatically expand government control of the economy. Republicans’ letter comes on news Senate Majority Leader Mitch McConnell is set to bring the Green New Deal to a vote in the last week of March. Senate Democrats are trying to avoid voting on the non-binding resolution and even put forward an alternative bill. Republicans in the Western Caucus, including Bishop, held a public forum on the Green New Deal in late February, and even invited the bill’s sponsor, New York Rep. Alexandria Ocasio-Cortez, who wasn’t able to attend. It seems doubtful Pelosi would agree to hold hearings on the Green New Deal. Pelosi referred to the Green New Deal as “the green dream or whatever” after it was introduced in February. Likewise, Pelosi has resisted her party’s calls for votes on Medicare for All and impeachment. Pelosi also remembers the defeat of cap-and-trade in 2010, despite Democratic control of both chambers of Congress. Pelosi’s office did not immediately respond to The Daily Caller News Foundation’s request for comment.